Kota Damansara Community Forest Reserve (KDFC), known in Bahasa as Hutan Simpan Komuniti Kota Damansara, was gazetted in 2010 for recreational, educational and research purposes. The reserve covers 320 hectares and is all that remains of the original 6600 hectare Sungai Buloh Forest Reserve which was first gazetted in 1898 but which has steadily been lost to urban sprawl over the past several decades. 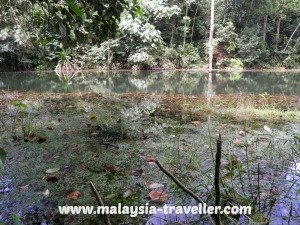 The reserve is managed by KDFC Society and the trails are used by both hikers and mountain bikers (except Petaling Trail which is not suitable for bikes). Here is a short YouTube video slide show of my recent hike. There are two main entrances to the reserve, one in Section 9 and the other in Section 10 of Kota Damansara. I used the latter which is on Jalan Merbah 10/1, 47810 PJ, just off Persiaran Mahogany. Here is a map showing the location. There is plenty of on-street parking here. Petaling Trail. An environmental education trail about 1 km long which was built by the Malaysian Nature Society and has since been improved with support from the Global Environment Facility Small Grant Programme. It is a 25 minute walk skirting a small lake. It is well signposted with information boards on the plants and creatures found here. The day I visited there were quite a few spiders’ webs across the path and lots of mosquitos. I preferred the other trails. Scout’s Trail. 2 km 25-40 minutes. Temuan Trail. 2 km 20-40 minutes. Sahabat Trail. 2 km 40 minutes. Aunty Sipew’s Garden. This wild garden showcases traditional plants used by the Temuan (orang asli) community. Arrange a guide through KDFC Society to explain the different types of plant and their uses and benefits. I must admit I found the trail layout and signage rather confusing for a first timer and I ended up doing the Scout’s Trail, Temuan Trail and Sahabat Trail in one long loop whereas I had intended to reach the Unity Trail. Still, no matter, it was an enjoyable hike and with the help of the little scraps of paper left by the Hash House Harriers (Trash House Harriers?) I was able to find my way back easily enough. I know the H.H.Harriers are a fine bunch of people and the papers are bio-degradable (eventually) but couldn’t the last person in the pack pick them up instead of littering the countryside? To help you find your way, there is a good map of the trail network on KDFC Society's website. Follow that and you won’t go far wrong. There is no entrance fee but if you use regularly why not become a member of KDCF Society to support their commendable efforts? No formal operating hours but the trails should only be attempted in daylight hours. Nice well maintained trails with plenty of signage, though a bit confusing in places. An enjoyable hike and bike location and convenient for those living in north-west KL.